Ten Minute Pages is a “What You See Is What You Get” web page editor that allows you to build web pages visually. To edit the contents of an object, simply double-click on it and just start typing. You can also move objects around the page by simply ‘dragging’ and ‘dropping’ them where you want them. To change how an object looks or behaves, click on it once, then select a new look in the tabs. You can also change how the ENTIRE page looks by clicking on the DESIGN tab. Awesome! To add NEW content to the page, select an object on the page, click the INSERT tab and then choose the item you want to insert. When you’re ready, click the PUBLISH button to instantly deploy the changes to your website. The first time you do, it will ask for your FTP Hosting Credentials. If you don’t have them now, you can still save your changes, it just won’t go live until you do. You can find the [PUBLISH] button in the [Home] tab. Go there now and click [Publish]. …Once you enter the correct settings, ALL future changes will be deployed LIVE to your site the INSTANT you publish them. Congrats! You now know how to use Ten Minute Pages. To start building your website, click File > New and select the type of page you want to create. We suggest starting with a landing page. 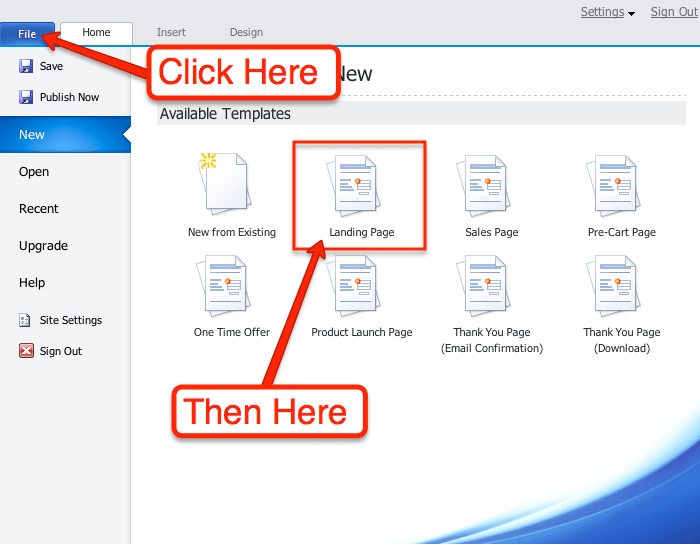 You will find the Landing Page in the FILE menu located at the top-left of your screen. Click [FILE], and then click [New]. From there you can select the type of page you want to create. When you need help, click the [QUESTIONS] button floating at the right of your screen.